Autolysis and that too for moong dal cookies? What reflects in your mind when you think of healthy cookies or say autolysis? Seems both are miles apart from each other. Okay, we can autolyze bread dough. 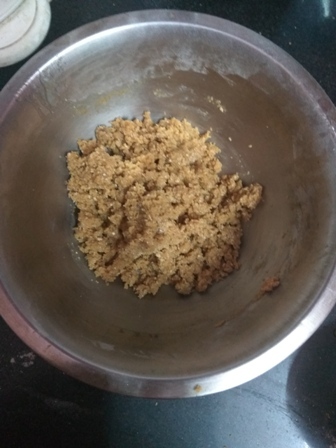 These days, after Rama Krishnan Sir's autolysis for roti dough, we have been blindly following the technique for kneading dough for chapatis, paranthas, puris, mathris, crispies, sev, and what not!! So why not cookies? If you have any doubts, read further. This healthy cookie recipe post will answer whether we can get crunchy bites with autolyzed cookie dough. I came to know about autolysis from the illustrious Chitra Vishwanathan, who had shared the technique and credited Mr Rama Krishnan, the OPOS mentor, for the same. Let me tell you, autolysis for atta kneading has changed my life. I have never looked back since I learned the technique to knead dough. It is one no-knead atta kneading technique that will make life easier for you. Soft, fluffy, and healthy rotis are the outcome each time. Moreover, I have started making diabetes-friendly dough with this technique. I will create a separate post on diabetes dough. This is one groundbreaking technique of kneading dough that relieves us all from the pain of endless kneading. 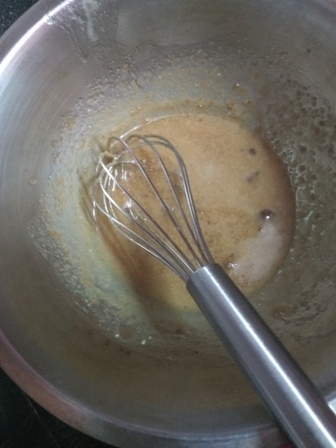 It is deceptively simple, since autolysis is all about mixing and resting the mixed ingredients and then letting it rest for anywhere between 20 and 120 minutes. The result is just awesome - after 30minutes or so, use wet hands to gather the ingredients and Tada! Your dough is ready. This is a common practice in the bread baking arena. The technique was introduced by Professor Raymond Calvel in his book, ‘The Taste of Bread.’ A research chemist by profession, Prof. Calvel brought about a revolution in the French bread making industry with this innovation. The technique became widely popular since it reduced the total mixing and kneading time and resulted in bread with an excellent flavor and a creamy crumb. So what happens during the resting time? Well, the flour absorbs the water on its own, rather than the water being forced into it with your hands, unlike traditional kneading. By now, enzymes in the flour have activated that help in gluten development. Not only this, these enzymes help in the breakdown of starch into simple sugar, which will help the dough rise/proof. Now you might be surprised as to how this technique would work for cookie dough, since we never knead the dough for baking cookies. Kneading results in gluten formation, which could make cookies chewy. This is not what we want in our cookies, right? We want crunchy bites - which should also be melt-in-mouth! So we do not knead cookie dough, nor are we doing the same in the autolysis technique. Ideally, the process uses water and flour - mix and let it rest. But for cookies, we replace water with oil or ghee and stir in sugar/sweetener and flour. Allow it to rest for 30 minutes and your cookie dough is ready in a jiffy!Surprised, are you? Well, this autolyzed healthy cookie dough recipe is a must try if you still do not believe my words. You have already tried my moong biscuits previously with baking soda. 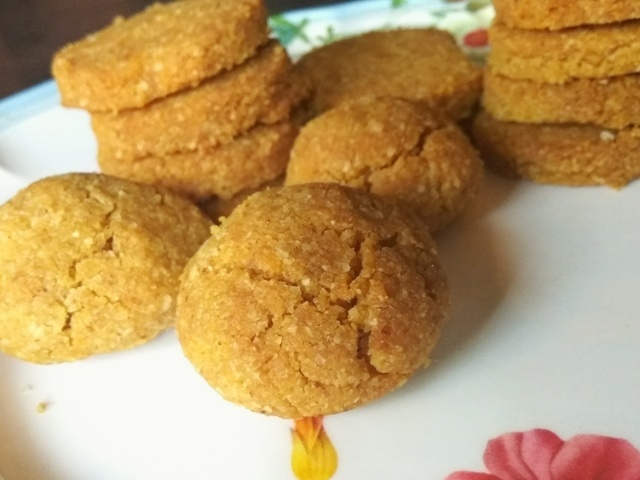 It is one batch of simple healthy aromatic cookies that you will fall in love with instantly. The aroma of roasted moong dal takes the cookie recipe to a different level. Roasted moong dal is exactly what we are using in this autolyzed moong cookie dough. Do not be surprised if there is a blast of roasted moong dal flavor in your mouth when you relish these melt-in-mouth baked beauties. Take my word for it! On top of it, there is no raising agent used in the recipe. I was just an experiment and it was a huge huge success for me. Couldn't have been happier! Let's cut the long story short and get back to the autolyzed moong dal cookie recipe. Dry roasting moong dal trick Check this video to make moong dal atta/powder at home. I will give you a simple trick for dry roasting moongdal....I always do this...after making rotis when the tawa or iron skillet s still hot, keep yellow moong dal on top of it...turn off the flame...your moong dal will be roasted beautifully this way..stir it once or twice so that it doesn't burn :) ...either wash moong dal before doing this or after ...when you wash the lentil, place it on a kitchen towel or tissue paper for drying..then you can grind it into powder when it cools down :) I never roast moong dal or any other lentil in any other way...it saves fuel, time, and energy :) I even dry roast my masala like this...you can dry roast nuts too this way....the options are endless!!! Let's prepare the ingredients for autolysis. Take all the wet ingredients in a bowl. 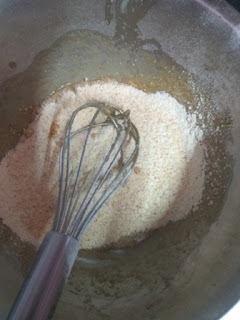 Add salt, sugar/jaggery/raw cane sugar. Whisk the wet ingredients until the mix is light and fluffy. Add dry roasted moong dal powder and oatmeal. Fold the ingredients until just mixed and keep aside for half an hour. After half an hour, gather the dough. DO NOT KNEAD. The lime-sized balls will give you moong dal nankhatai and the flattened beauties will be your moong dal cookies. Preheat oven to 170degrees for 10 mts . I made this batch in my airfryer. I preheated it for 5 mts. Bake or airfry the moong cookies for 12-15 mt. Keep an eye on the beauties after 12 minutes. Do not let them get too browned. You will love to see the cracks on your moong dal nankhatais. 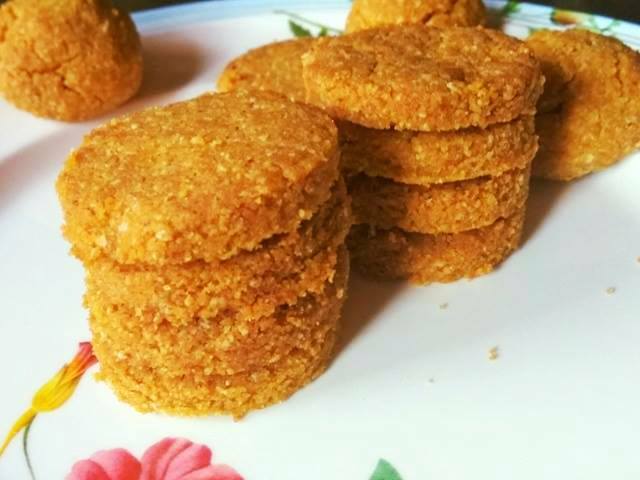 Enjoy a blast of flavor when the no baking powder moong cookies cool down. The compliments from my mom and dad are enough to make my day. My dad is already a big admirer of my bakes now, especially cookies. Mom loves my cakes too. Nevertheless, this autolyzed cookie dough was just an experiment to see how things go. But its success has aired my curiosity to try out more cookie recipes with autolysis. Let's see where I go from here. Keep coming back to this website for more miracles! Do give these airfryer cookies a try. The best thing about these healthy cookies/beauties is that you can try them out in a cooker, microwave or oven and enjoy delicious bites. Here is the process to make cookies in cooker or tawa. hello Ravneet... thank you for introducing me to the autolysis technique. I will surely try these cookies. Autolysis technique is new to me Ravneet ..it sounds so easy and interesting..would love to try it. And the cookies look so perfect.. beautifully done ! Thank you, Poonam. Autolysis will make life easier than ever. Do give this no-knead technique a try. You will never look back to kneading dough the old way. Very nicely explained. Would love to try this soon. Thank you, Neeru. Would love to hear back.